Archaeological material of IV and VI AD of Nokalakevi. Currently, David's main interest is the 1st Millenium BC in Nokalakevi. In 2005, David secured funds from the Ministry of Culture and Sports for the renovation of the Nokalakevi Museum. In 2000-2001, by the order of world Bank, David oversaw the conservation and restoration work carried out on the Egrisi Kings’ Palace (VI c) in Nokalakevi. 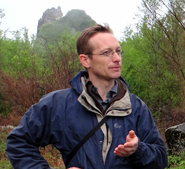 In 1995, David oversaw the conservation of a water basin (IV-V cc) unique in all the Caucasus and a fortification tower in Nokalakevi (the capital of Egrisi Kingdom). The work was carried out by order of the “The Open Society of Georgia” foundation (the Sorosi’s foundation). 1991-1994 Senior scientific researcher in the S.Janashia’s Museum of Georgia. 1981-1990 Scientific researcher in the S.Janashia’s Museum of Georgia. Niko's main inerest is in the Archaeology of West Georgia (Colchis and Egrisi). In 2007, he held the position of Archaeolgical scientist at the Georgian National Museum and later in 2011 became an assistant curator. He has been involved with the Anglo-Georgian Expedition since 2003, becoming a site supervisor in 2006, deputy head in 2011 and head of the expedition in 2014. Outside the expedition, Niko has been active in a number of projects aimed at the protection and restoration of historical and archaeological monuments in West Geoaria. 2014 - Coauthor - AGEN Trench A Results: 2001-2010. Coauthor. Nokalakevi • Tsikhegoji • Archaeopolis. Archaeological excavations 2001–2010. Anglo-Georgian Expedition to Nokalakevi. BAR International series 2612, Archaeopress, Oxford, England. p. 25-42. 2012 - N. Murgulia. The fortification System of the central part of the Egrisi Kingdom. Bulletin of the Georgian National Museum, Vol. III (48-B), p. 82-100. Candidate of Science (Doctoral) in History. Georgian history of the 4th-8th century AD Certificate of training in Archaeological Studies, Museology, Conservation and Excavation. 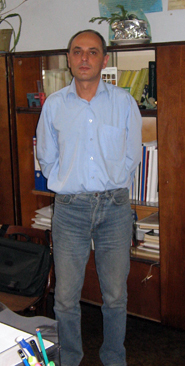 In 1981, Beso started work in the Medieval archaeological department in the Georgia State Museum and now holds the position of senior scientific worker. At the same time he started working with the Georgian Expedition to Nokalakevi and continues to this day as its deputy director. In 1991, he submitted his thesis in history, themed on the cities in West Georgia of the 4th – 8th centuries and specifically Archaeololis, Nokalakevi. 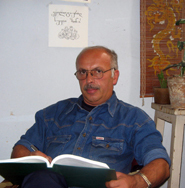 He has published 20 academic articles in History and Archaeology in Tbilisi and Baku and also 4 children’s books in the history of Georgia. In 2001 one of his children’s books, entitled “the world of Georgian Mythology” was nominated for the Georgian State Premium book prize. He is the author of the new education standards (curriculum) in History and will train teachers in this new standard from 2006. In 2004, she was awarded her doctoral degree, which was entitled: “The scientific bases of the restoration-conservation of archaeological metal”. 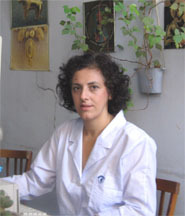 In 1986, Nino started work at the Chemical-Restoration laboratory of the S.Janashia’s State Museum, Georgia and in 2003 became head of the department. Nino currently works on restoring and researching archaeological metal, glass and ceramics from all institutions in Georgia, these include the Centre of Archaeological Research, Nokalakevi Museum, Batumi Museum and Vani Museum. In 2002 Nino became the Anglo-Georian Expedition's chemical restorer. 9. KEBULADZE Nino, MESKHIDZE Eka, 2004, “On the restoration and conservation of the double zoomorphic figurines from the city of Tsikhegoji-Archaeopolis” (West Georgia), Ukrainian ceramological journal, #2-3, ISSN 1810-4843, Opishne. 10. KEBULADZE Nino, TVALCHRELIDZE Zurab, 2003-2004, “Note on the study of the material was found in the lamps from Ivrispiri’s Qvabebi”, “Moambe” of the Museum, #45, ISSN1512-1895, Tbilisi. My main research interests are the South Caucasus in Late Antiquity and the Late Roman classicising historians. I began work on the South Caucasus over 20 years ago with an undergraduate thesis that later developed into a doctoral dissertation. I studied modern and classical Georgian as part of my doctoral studies at Oxford and I've been a regular visitor to Georgia and the Caucasus since 1998. I have a working knowledge of Georgian and wide experience of the country and the wider Transcaucasus. As Director of the archaeological expedition to Nokalakevi since 2001 I've had the privilege of introducing some 200 archaeological volunteers to Georgia, its history, archaeology and culture. I also lead specialist Historical and Archaeological tours for leading UK companies, Martin Randall, Andante Tours and Steppes Travel. I've worked at both Oxford and Cambridge, including supervising undergraduates for the Near East in the Age of Justinian and Muhammad option. I have been involved in archaeology, in some capacity or another, since the age of 16 when I was a trainee on an excavation at Wroxeter Roman city. Over the last 25 years I have seen field archaeology through the eyes of a young amateur, an undergraduate student, a postgraduate student and a full-time professional. As the Site Director of the Anglo-Georgian Expedition I believe my priority is to ensure that we have a well organised, professionally excavated site, but I also hope that the volunteers we train each year experience the same wonder, joy and passion for archaeology that I have experienced over the years. I have had the privilege to work on many stunning sites during my career. These include Roman buildings excavated whilst I was with the Museum of London Archaeology Service and described by the "Evening Standard" as "London's Pompeii"; huge Iron Age farmsteads in the Cambridgeshire Fens; and impressive Neolithic Cursus monuments in Dumfriesshire. However, I believe that the site of Nokalakevi must rate as a world class archaeological wonder, albeit little known at the moment, and represents an unmissable experience for anyone with an interest in archaeology - regardless of what stage of their career they may have reached. Areas of interest are osteoarchaeology, taphonomy, site formation processes and associated recording methodologies. Geographic areas of interest are the Black Sea Littoral, specifically that of Helenistic Colchis and the Medieval and Meroitic periods of Sudan. 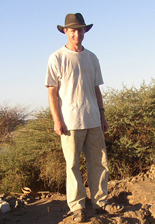 I am a member of the British Association for Bological Anthropology (BABAO), The Paleopathology Association (PPA), the British Institute at Ankara (BIAA), and the Sudan Archaeological Research Society (SARS). Nick started his career as a field archaeologist in 1989 and continues to this day. He has excavated sites from the Neolithic through Roman to the late industrial period all over Britain. Now settled in Cambridge, Nick specialises in the conservation of historic monuments. 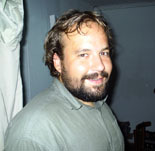 In 2000, Ian Colvin asked Nick to carry out a feasibility study with Professor Lomitashvili of the possibility of a collaborative excavation of the Archaepolis in Nokalakevi. It was decided that a small scale excavation to further explore the stratigraphy and phasing of the site around the lower town fortifications was an important first step to further build on understanding the complexities of its occupation.